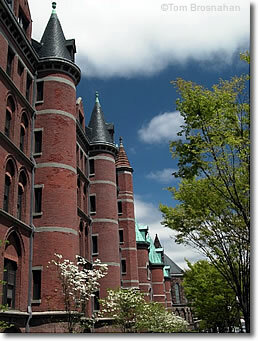 A few of New Haven's hotels are an easy walk from the campus of Yale University. Others are a short drive away. Several hotels are right in the center of New Haven, within walking distance of the New Haven Green and Yale University campus. Other hotels are grouped by the interchanges of Interstate 95 and the Wilbur Cross Parkway (CT Hwy 15), only a few miles—a short drive—from the city center. Hotels in the center include the 3-star, 207-room Courtyard by Marriott New Haven at Yale, northwest of The Green and only a 10-minute walk from the Yale campus; the 3-star, 119-room New Haven Hotel, southeast of the campus and also only a 10-minute walk; and the 3-star, 112-room Premier Hotel & Suites New Haven, just off Interstate 95 Exit 46, 2.7 miles (4 km) south of the campus.